As a 12-year-old growing up in D.C, one of Ron Hamiltom's favorite Christmas presents was an MPC 1969 Dodge Coronet R/T model car kit. Built in the style of the day, that car would up painted in Pactra Metallic Turquoise and donning drag slicks and mag wheels. 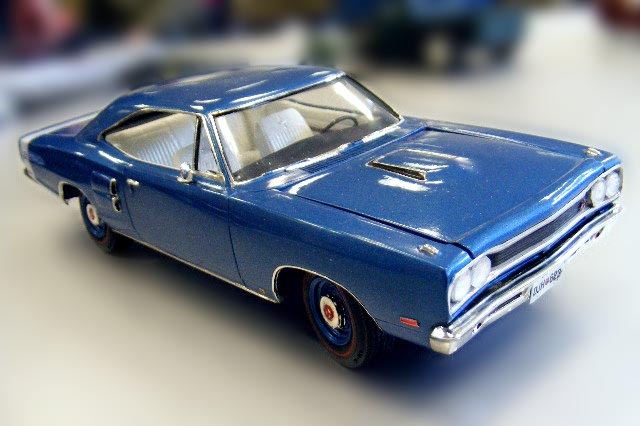 About fifteen years later, Monogram released a 1969 Dodge Super Bee kit. Ron built one of those, too -- yellow on black with a Bumble Bee Stripe. Ron still has the Monogram Super Bee, but over the years the MPC kit went missing. Wanting to build another Coronet R/T in later years, Ron found that they'd become prime, expensive kits on the secondary market in unbuilt condition because they were so long out of production. Eventually he found one for sale at an affordable price. It was partly assembled with a custom front end attached, but unpainted. And it was shy of a few parts, including the engine, hood, stock front end, front bumper, wheels, and tires.